Mother bleeping dinosaurs | More blue fabric? It’s probably no surprise that I’m a bit of a fan of dinosaurs (hi there multiple jumpers, multiple necklaces, and an attraction to line drawings featuring dinosaurs). 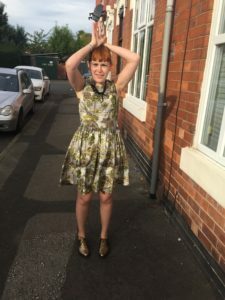 For quite a while I’ve had a dream of making a dinosaur dress, but finding fabric that wasn’t obviously children’s fabric was pretty difficult. I like the Lizzy House fabric from a few years ago that a couple of people have used before (with a special shout out to Elle’s fabulous skirt) but I wanted something that was closer to the natural history style drawings in my dinosaur magazine when I was a kid, the thing that was my main introduction to all things dino. 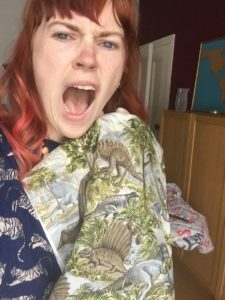 One day, for no reason other than I wanted a five minute procrastination break, I found myself trawling “dinosaur fabric” on etsy. And there it was. The most perfect, naturalistic styled drawings of dinosaurs, all over a 3 yard chunk of fabric. Needless to say, I bought it as soon as I could, and squealed with delight when it arrived, throwing it straight into the wash. But then it just sat there. A bit like the Nani Iro fabric, I was too darned scared to cut into it. 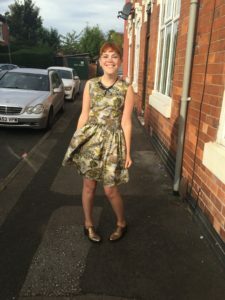 Roll around September, and this year’s Sew Brum. 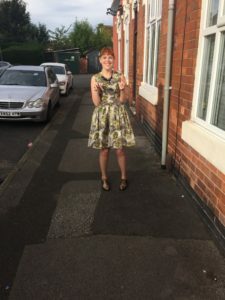 I knew I wanted a new dress for the day and I knew I wanted it to be something exciting and special. And just like Jurassic Park, it was time to bring dinosaurs back into existence (although with hopefully fewer negative repercussions and people getting eaten by out of control raptors). 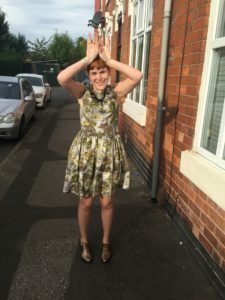 A mother bleeping dinosaur dress! 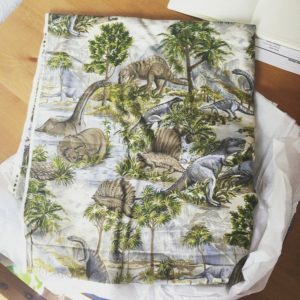 DINOSAUR FABRIC! I found it on Etsy back in April, although the seller at the time doesn’t have any left. It’s 1980s cotton, and if you want to try finding it for yourself, the selvedge says “Hollytex” on it. The Mortmain, because I wanted something that I knew I could make without worrying and that wouldn’t disrupt the pattern on the front too much. 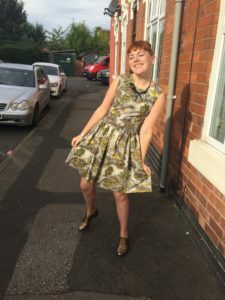 I put a gathered skirt on it this time, and it’s about time too that this happened, it makes it even swooshier than the box pleats on the standard pattern. Getting to work with dinosaur fabric. Once the dinosaur love is out of the way, I’m really pleased with the pattern matching on this one. The side seams are neat as a button, whilst on the back seam I managed to get the T-rex’s tail to match on either side of zip. Plus, at the waistband, I managed to get the pattern to line across the bodice and the waistband across all three bodice pieces. This felt like a real step forwards in the pattern matching stakes. As far as the Mortmain is concerned, never say never! Next > Stationery addicts of the world unite!